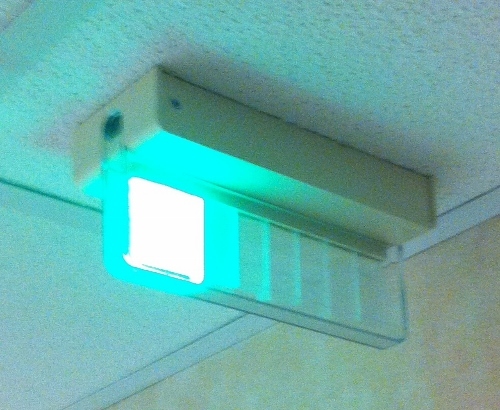 A call light is one of the most important items used by every patient in a hospital or similar facility. They are in every room and should be given to every patient admitted no matter what their condition is. Although their usefulness is obvious in facilities, they can be purchased for home use as well. What is a call light exactly? 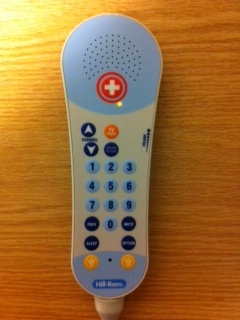 It is a remote patients use to call for assistance. The main, and sometimes the only, button on the remote is most commonly known as the nurse button. Every time I get a new patient, I always explain what all of the buttons on the remote do but I always emphasize that the nurse button is the most important of all. Some may have other buttons such as turning on/off the lights, turning on/off the television, adjusting the television volume, changing the channels, and adjusting the bed, but I want to focus specifically on the nurse button. This button is what makes the remote so important. Without it, your patient would not be able to call for help. The tiny little light right next to the red nurse button sometimes confuses patients. They think it means the button is being pressed and needs to be turned off. Just explain to them that this light stays on at all times and is there so they know where the button is located in the dark. We have actually upgraded our call lights to include two more call buttons for a total of three. There is a big red button that calls the certified nursing assistant (CNA) directly and is just considered a regular call. Then there is a button to the left of it that is smaller and has a picture of a toilet. This button is pressed if the patient has to use the bathroom and also goes straight to the CNA. Then there is another smaller button to the right that looks like a pill that is sometimes referred to as the pain button. This button calls the registered nurse (RN) directly. I actually do not like this call system. I see what was intended and the potential for it, but it is just too complicated to explain to patients. This is especially true for patients with dementia or sundowners. Not to mention it can be hard to figure out which button is which in the dark at night. I propose for there to be only two buttons. One for the CNA, and one for the RN. That way the patient easily knows which one calls who and doesn't have to worry about any other variables. The roles of each should be explained so they know who to call in which situation. I've lost count how many times the wrong button was pressed for the wrong situation. Yes some patients grasp the concept, but too many of them don't. I feel like a simple modification of removing one of the buttons would fix a lot of unnecessary confusion. I think it is just silly and redundant for two buttons to go to the CNA. Another device that can be used is called a blow bell (pictured). This device attaches to the side rail on the bed. 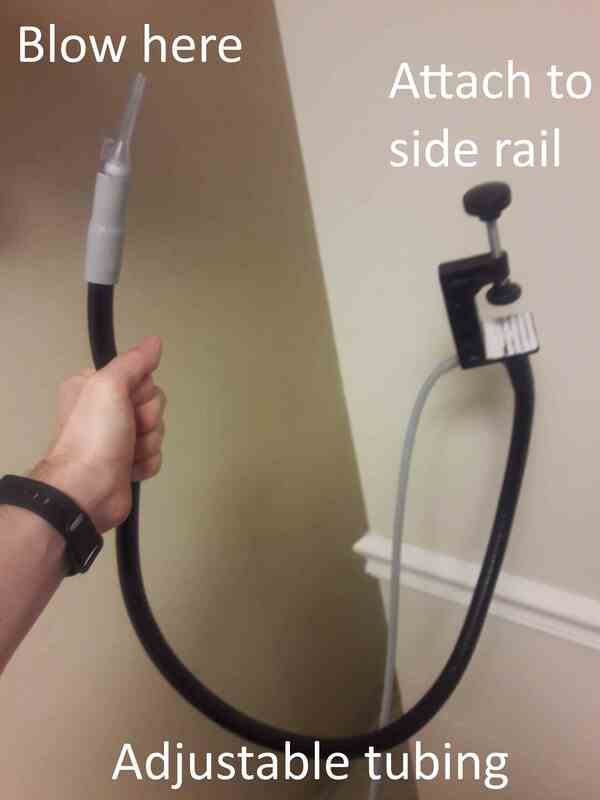 The adjustable tubing stretches towards the patient's mouth. When they need to call, instead of pressing a button, they blow on the end that looks like a straw. This is commonly used when there is limited upper extremity mobility and hand grip strength. This may be because of an acute injury, weakness, or paralysis. This prevents them from having to yell to get someone's attention. 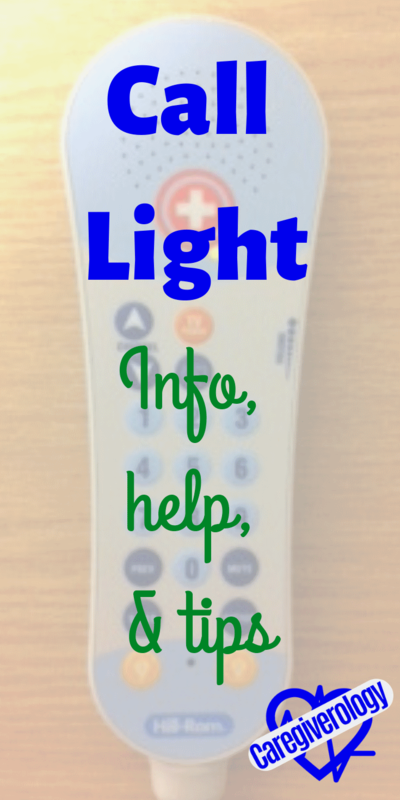 Every time you go into your patient's room, before you leave, make sure that call light is right next to them and they know exactly where it is. I've gone into rooms before and the patient will tell me they needed to call for help but their remote was out of reach. Do not let this happen, especially if they are on bedrest or are a fall risk. I've checked on patients before and they've told me they've needed help for a while but couldn't find the remote. Then I find it underneath their covers or under their pillow. When you give it to them, put it directly in their hand or tell them where you are putting it. You should also make sure they aren't pressing the wrong button. There are actually nurse call buttons on some of the beds we have but they don't work. A trick I've learned is to place something such as a heart monitor lead directly over the nurse call button so it stands out even when the patient isn't looking at it. This is especially useful at night or if the patient is blind. Just be sure to place their thumb over the tele lead, ask if they can feel it, and tell them to press down on it if they need help. Try to put the remote in a place where it won't fall. I can't count how many times I've seen or heard one fall. I've had countless patients tell me there needs to be a holster to securely place them where they won't fall and I couldn't agree more. I've actually seen a basket like device that attaches to the side rail where the call bell can be placed. If you see something like this, take advantage of it. Ours actually come with a clip so they can be clipped onto the side of the bed or to their incontinence pad or pillow. Another option is to wrap the cord around the bed rails. Do whatever you have to do to make sure it doesn't fall. If you hear or see a patient calling, even if they aren't your patient, answer the call light or go straight to the room immediately. Don't ever assume the call isn't important and can wait, just answer it. It should just become an instinct. Where I work, the secretary used to have to answer the call and then call us to let us know what patient called and what they need. Now we can answer calls directly over our phones that we carry with us everywhere and talk to the patient directly. When you answer it, make sure you use a professional but friendly voice. Talk slowly and clearly and always assure the patient that you understand their request and are sending help immediately. Giving short and dull answers makes the patient feel like they are being a nuisance or you are not taking their request seriously. Also be aware that the patient may not hear you over the speaker. There have been many times where they simply couldn't hear me talking to them or couldn't speak themselves. Do not show anger or frustration in these situations. More than likely, they aren't simply ignoring you. There is a reason for the lack of reply. At the facility I work at, we carry phones around and get paged when a patient calls. Five minutes after we get the page, the call will go into overtime and we will get paged again. This is frowned upon and should never happen. If you are unable to get to a patient in less than five minutes, you should ask for help. Don't forget to cancel the page when you enter the patient's room. This is usually done by pressing a cancel button on the wall close to where the call light is plugged in. Although this is very simple, it is also easy to forget especially when your main focus is on the patient's needs. We actually have a system set up now where we have trackers that turn off the page after we enter the room. You just have to make sure the room detects you. It usually takes a few seconds to activate. If for some reason it does not, there should be a control panel somewhere in the room where it can be turned off manually. What if you get multiple calls at the same time? You ask for help. What if everyone else is too busy to help? Then you prioritize. Use your best judgement at determining who needs help the fastest and the most. A patient in need of bathroom assistance would be more of a priority than one who asked for ice water or another blanket.